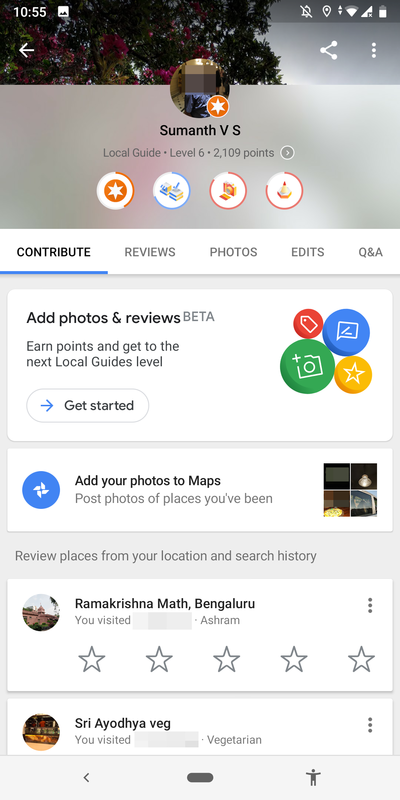 If you’re an avid Google Maps Local Guide, or even a beginner, you’ve probably noticed that the app helps you figure out what to review and which photos to upload. The Your contributions section has plenty of suggestions, but the interface is a little confusing. Pending ratings and reviews are on the main page, but suggested photo uploads are accessible from a separate banner, and there’s no easy way to go back and add more info to what you’ve already submitted. Maps is working on improving all of this. 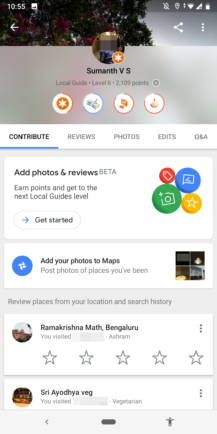 In the contributions section of Maps, you may find a new Add photos & reviews BETAbanner. 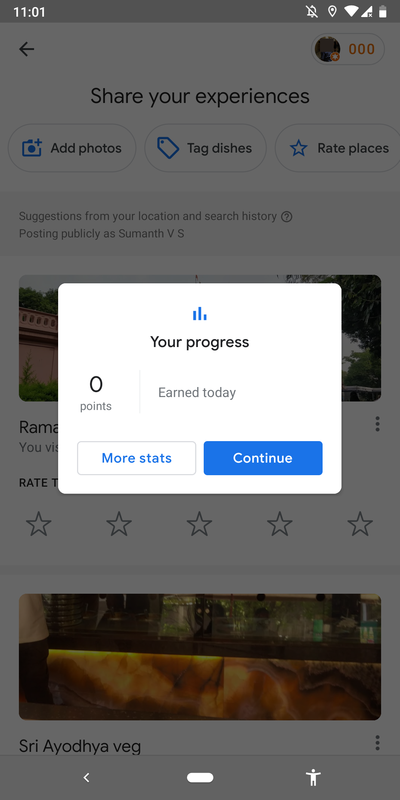 It hides a new interface with a scrolling list of four different things you can do: add photos, tag dishes, rate places, and review places. Below that are the places you’ve been to recently and that you haven’t reviewed. Compared to the existing UI, the thumbnails take up the entirety of the screen and the place’s name is more readable. Left: New contributions beta banner. Middle & Right: New contributions UI with four sections. The counter at the top right shows how many points you’ve gained during this session. Tapping it reveals your progress and a link to stats. Moving on to the four sections, let’s start with the photo submission. The interface is different, but functionally, nothing seems to have changed except a new Select all button. 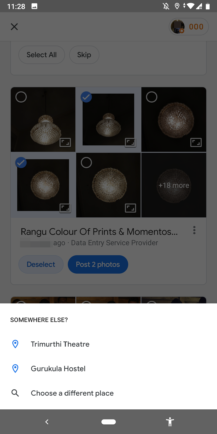 You can still change the place you’re submitting photos for, in case the location wasn’t properly detected. Left: Session progress. 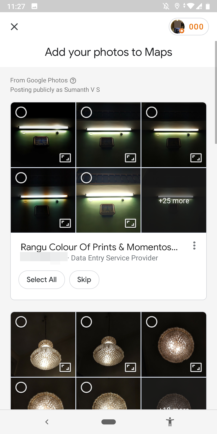 Middle & Right: Adding photos to places. The more important changes become apparent in the the next tabs. 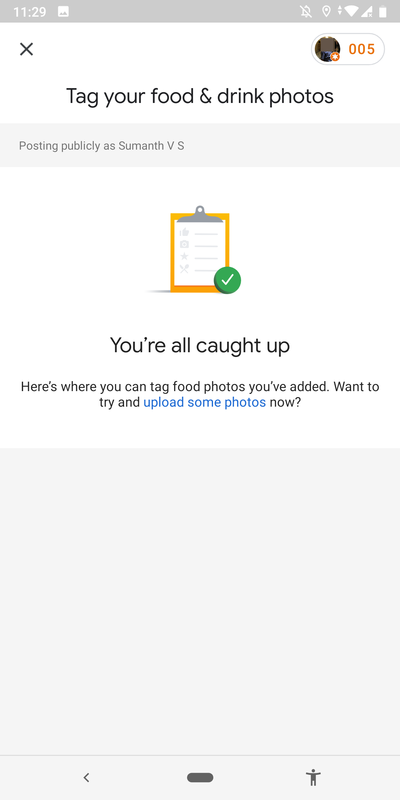 First, there’s tagging photos of food and drinks. If you’ve already uploaded pics and didn’t tag them, they’ll show up here and you’ll be able to add tags quickly, without having to go check all photos you’ve shared one by one to see which is tagged and which isn’t. Same as when uploading photos of food, you get suggestions so it should be easy to find the name without racking your brain to remember what it was. 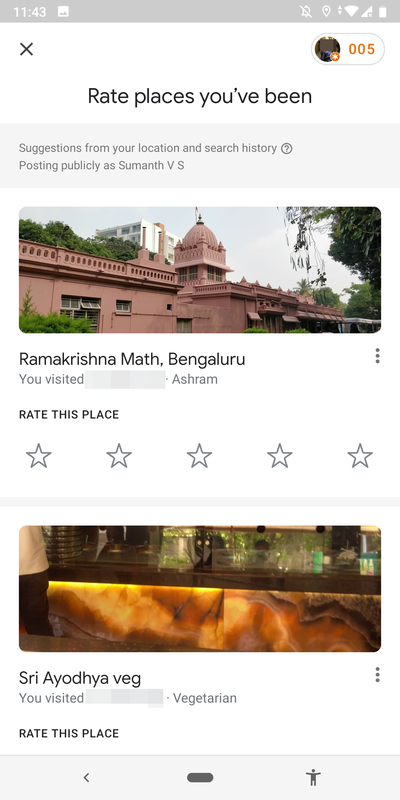 Next up, you’ll find the section to rate places you’ve already visited, which is just a rehash of what we’ve seen a few paragraphs above. Finally, there’s the section to review places you’ve already rated but didn’t write about. Finding these was impossible before, unless you scrolled through all your reviews and checked which ones had text and which were a simple rating. Now you’ll be able to find them easily, and thus gather some points by writing about them. Left: Food photos needing tags. Middle: Rate places. 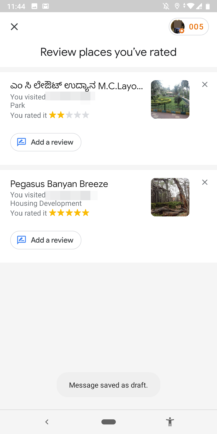 Right: Review places you’ve rated. It remains to be seen whether this new interface fixes the issues I’ve had with the existing contribution suggestions. Maps always surfaces photos I’ve already uploaded, asking me to submit them them, which could create dupes and get the Local Guides account suspended. It happened to me last year, so I know first hand this can be a real issue. 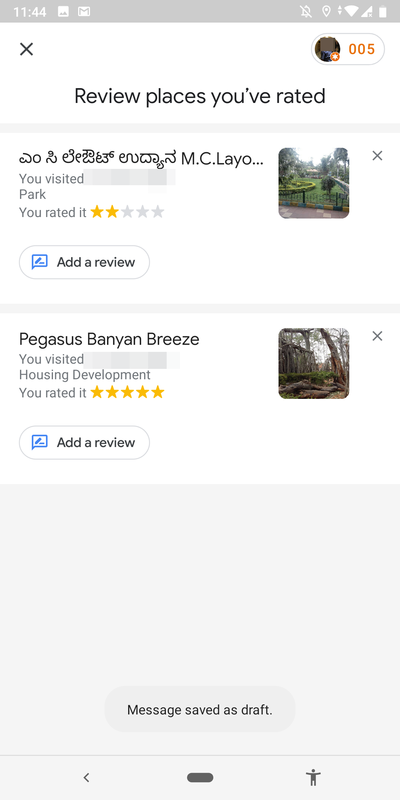 Another problem is being asked over and over again to review or add photos to a place when I’ve dismissed it several times already. The algorithm is stubborn and doesn’t get that this isn’t something I want to contribute. Hopefully, these two annoyances are fixed with the new interface… one can dream. The new contributions UI appears to be part of a small server-side test. We’ve checked with over a dozen Local Guides in various countries and none have it, despite being Level 6 or above. 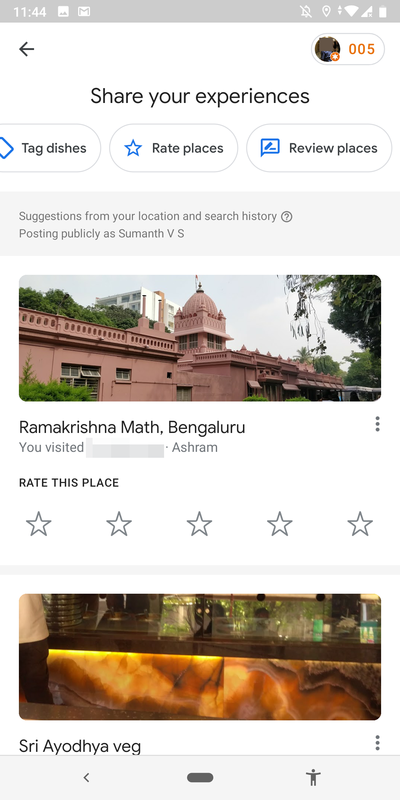 If you want to see whether you have it, grab the latest Maps v10.14.1 from the Play Store below or from APK Mirror.